Important message for all Ellis Broadbent 225lb Extractor users. New Safety Update issued. 2011. 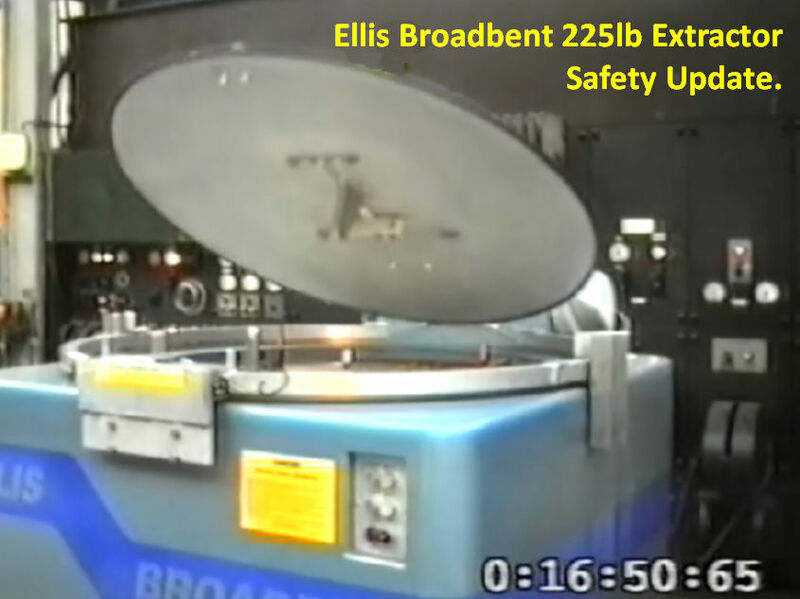 A revised and updated set of operating and maintenance manuals and documents have been issued for the Ellis Broadbent 225lb Extractor. Copies of this information and updated extractor warning labels have been sent to all known Ellis Broadbent 225lb Extractor users. Additional copies of the manual are available here. Do not use the extractor without first reviewing and acting on the content of this Safety Update 2011 and updated operating and maintenance manual. All owners, engineers, and operators of Ellis Broadbent 225lb Extractors should refresh their understanding of using and maintaining the extractors by reviewing the contents of the updated 2011 manuals by clicking here. As with all mechanical equipment maintenance becomes more important as the equipment ages. All 225lb extractors are now at least 20 years old, some much older, and adherence to all the operation and maintenance sections in the manual is important to avoid hazards and maintain the safety of those operating and working near the extractors. The extractors must not be operated without the mandatory lid safety restraint system kit fitted which are available free of charge from Ellis / Broadbent for 225lb extractor users. For more information go to our Service download pages by clicking here. 1400 W. Bryn Mawr Av.